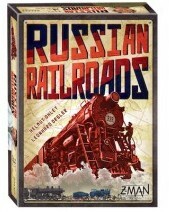 During Russian Railroads, players compete to construct the best railroads in Russia. Whilst there is no map to build across like many railway games, Russian Railroads is a meaty, worker-placement eurogame. Each round, players take turns allocating their workers (cool-looking meeple with Russian hats) to various actions on the main game board. For example, a player can lay track along their 3 different rail routes which advances the relevant matching colour marker along any route(s). There are 5 colours of track marker in the game (each route requiring a different mixture of track marker colours) but these colour markers are not allowed to pass one another or occupy the same space, so this means you’ll need to consider the order in which you advance the track markers too. Players can also use workers to build and upgrade locomotives that are placed on the rail routes. At the end of each round, players score the track spaces their locomotives can reach, plus there are some other bonuses when locomotives reach certain spaces too. Players usually have to take the lowest numbered locomotive available so the timing of building these is important. Players can build factories – the factory tokens look cool as they neatly slot into the notches at the bottom of the player boards. Plus, players can use actions to advance their industry marker along the industrialisation track; however, the track has gaps in it which are filled in when factories are built, so a player must build factories if they are to advance their industrialisation. Moving an industry marker onto a factory allows the player to instantly use the factory’s ability. There are engineers on the main board. Two engineers are available each turn and players can use their actions by placing workers like normal action spaces. Plus, one other engineer can be hired each round and the engineer remains with the hiring player giving them their own special (private) action to use in later rounds, plus they can earn points at game end. The engineers on the board change as the game progresses. There are a few extra actions too which can earn things like extra roubles (required for some actions and can replace workers too), temporary workers, etc. Almost all actions can only be used by 1 player each round so players need to pick carefully and watch where other players are placing their workers too. At the end of each round, players score points for their 3 railroads and industrialisation. Points from railroads are based on first x spaces where x is the level of the locomotive(s) on that track, and each space’s score is based on the most valuable colour track marker that has reached that space (with later track colours scoring more points). So, laying track over a long distance is of little use until you only have a high-enough numbered locomotive. Players score points for how advanced their industry marker is too. At the end of the game, players score points based on any bonus cards they may have, and having the most or second-most engineers too. As you can see from the outline description above, Russian Railroads contains much to think about. None of the rules are complex in themselves but there is a lot of elements to balance. The artwork looks really good with clear icons too, plus the cover artwork is superb. It looks like it should be an excellent, meaty eurogame. 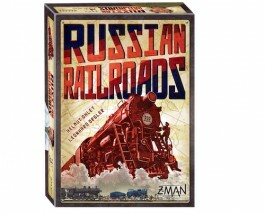 This entry was posted on Friday, October 18th, 2013 at 1:16 pm	and is filed under Board Games, Essen Spiel 13, Preview, Russian Railroads, Spiel 2013. You can follow any responses to this entry through the RSS 2.0 feed. You can leave a response, or trackback from your own site. Mate picking it up for me from Spiel13. Excited to play it. Yeah, it does look promising.